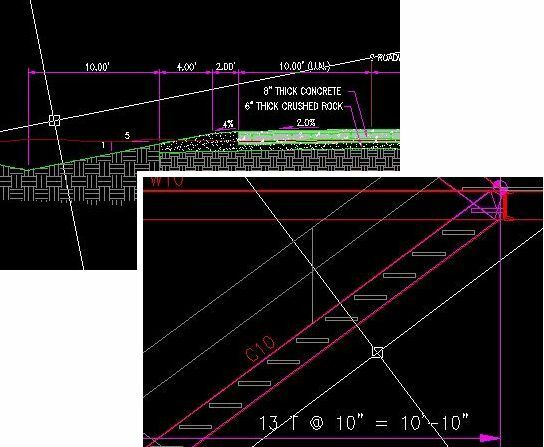 This is handy little routine for easily drawing slopes specified by percent grade, or rise/run in AutoCAD. Simply enter the desired slope, and hit "Set Slope" to set your cross hairs on the slope. Run the routine again and hit "Reset" to return your cross hairs to their normal (orthogonal) position. b) Architectural and Structural Details. Let's have a look at the Set Slope's dialog. Input rise/run it calculates the percent grade (or input grade and it calculates rise/run) and sets AutoCAD's cross hairs. 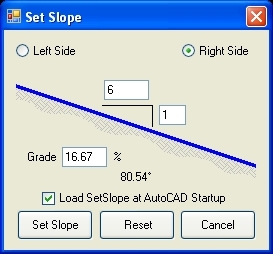 Just specify the desired slope, right/left side, and hit the "Set Slope" button, it's as easy as that. This download contains a .NET compiled DLL plug-in specifically designed for AutoCAD. The demand load feature allows SetSlope to automatically load every time AutoCAD starts, making it an easy to use addition to the normal AutoCAD command set. Installation is a breeze using a windows setup program. This download also contains a VBA version (for AutoCAD 2006 and earlier). The use of AutoCAD plug-ins requires workstation administrative privileges.